Touching down on the Asian continent after an eventful Australian Grand Prix, the 2010 Formula 1 tour prepares for their 3rd race of the season, the Malaysian Grand Prix. Coming off victory in Australia with his McLaren-Mercedes, Jenson Button returns to the 3.444 mile Sepang track as the defending race winner from 2009. 2010 competition ofr the Malaysian race is expected to be tough as the driver of the ultra-fast Red Bull Racing cars and the consistent Ferrari F2010s have shown early season strength. As Formula 1 competitors and cars braced for Saturday qualifying, memories of the 2009 Malaysia race were probably flowing through many minds. Last season, the downpour followed by a mid-race thunderstorm permanently halted the Malaysian Grand Prix after running 33 of the 56 lap distance. In the final moments of the 3rd qualifying segment, rain became so intense that FIA race stewards threw a red flag. With qualifying run, the Red Bull-Renault of Mark Webber set the fastest time by a considerable 1.3 second margin. 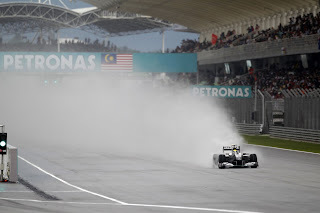 Timing his run perfectly in before the heavy rain hit, Webber was able to blitz around the Sepang track 1 minute 49.327 seconds on intermediate Bridgestone race tires. Mark Webber takes the pole for Malaysian Grand Prix the weekend after getting reprimanded by the FIA for rough driving in the latter stages of the Australian Grand Prix. Webber bested the Mercedes GP driver Nico Rosberg who joins the Red Bull-Renault on the front row. The second Red Bull Racing driver Sebastian Vettel starts right behind Mark Webber in 3rd place on the grid. Overall for 2010, Red Bull Racing has shown incredible pace but has encountered incidents through the first two grand prix events both mechanical and contact related. In an outstanding fourth place, Adrian Sutil placed the Force India-Mercedes in the best grid position since his second place qualifying effort in the Italian Grand Prix at Monza last season. Not typically a front-running team, Force India has made massive strides to becoming a full-fledged Formula 1 constructor. Sutil's teammate Vitantonio Liuzzi also performed admirably in Malaysian Grand Prix qualifying placed 10th on the day. Joining the front of the grid, Williams F1 also had an overall stellar performance. Setting 5th and 7th fastest times, Williams' rookie driver Nico Hulkenberg outrun his more experienced teammate Rubens Barrichello. Barrichello, holding the most starts of an active Formula 1 driver, was not the only seasoned veteran bested by his younger teammate. In the Mercedes GP team, Nico Rosberg 2nd place start tops Michael Schumacher who mustered an 8th place time. While Lewis Hamilton through the first two Malaysian Grand Prix practices on Friday, Hamilton and the McLaren team had trouble finding pace amongst a wetter Saturday time trial. Having the worst qualifying luck of the McLaren F1 team was Australian Grand Prix winner Jenson Button. Benefiting from a daring wet weather strategy last week at Albert Park, the intensifying precipitation around Sepang elected not to cooperate with the reigning Formula 1 Driver Champion. Failing to find traction on Bridgestone intermediate tires, Button slid his McLaren-Mercedes off the circuit in the 1st round of the knock-out qualifying. Resting in the sand trap, Jenson Button was unable to improve on his 17th place time even though he was eligible for the second round qualifying. McLaren teammate Lewis Hamilton remained on track (particularly after McLaren opted Hamilton onto full rain tires) but finished slower in 20th. If the struggle of the McLaren team wasn't surprising enough, the legendary Ferrari Formula 1 team was also bitten by speed issues on Saturday. Sandwiching Lewis Hamilton's McLaren, Fernando Alonso placed 19th while Bahrain Grand Prix winner Felipe Massa seeded in 21th. In fact, both of the Lotus-Cosworth cars outran the vast resources of the Italian auto racing powerhouse. Weather conditions are expected to be wet for the 2010 running of the Malaysian Grand Prix set to start 4 p.m. Sunday Malaysia time or 4 a.m. Eastern time. With quality driver and teams at the back of the field, the start of this grand prix is certainly going to be worth watching.